The state of Perak is located at the west coast of Peninsular Malaysia between the states of Penang and Kedah in the north and Selangor in the south. Meaning silver in the Malay language, this name is said to have been derived from tin ore that have enabled this state to grow economically in the past. The Kinta Valley used to contain one of the world's richest tin deposit. Since then the economy of the state has diversified from dependence on tin and farming into manufacturing, tourism, trade, commerce and construction. Ipoh is the capital of this state of over 2 million people. The other main town is Kuala Kangsar, the Royal town. Taiping was formerly the state capital but still remain one of the most visited town in this area. Lumut is the gateway to the popular Pangkor Island. The leaning tower of Malaysia is located in Teluk Intan. 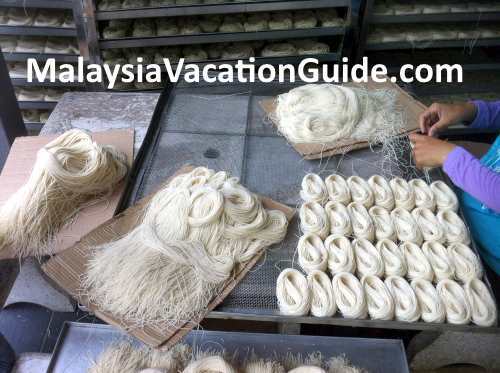 As Ipoh is about 2 to 2.5 hours drive from Kuala Lumpur, most visitors will prefer to use a coach, cab or self-drive although this city has an airport that connects it to major towns of Malaysia. Lonely Planet in 2016 has listed Ipoh at No. 6 for the Top Ten Best Asian Destinations to visit in 2016. It is famous for bean sprout chicken and Lou Wong Restaurant, Add: 49, Jalan Yau Tet Shin serves this dish and is packed with customers during the peak hours. Here are some other food that you may want to consider trying. Coffee produced by Chuen Kee Coffee Factory in Menglembu has been around since 1957. Although the beans are imported, you can see how they are being processed using traditional wood fired ovens. Get a cup of coffee here and buy more to bring back home if you enjoy it. Address is 1153, Jalan Lahat Simpang 4, Perak, Menglembu, 31450 Ipoh. Punjabi food can be enjoyed at Gurmeet Singh's stall which is located at New Weng Fatt Cafe & Restaurant. This stall serves "chapati", "paratha" besides chicken and mutton curry. Address is 1, Lebuh Taman Ipoh, Taman Ipoh Selatan, 31400, Ipoh. Egg tarts produced by Choy Kee Confectionery is usually sold out in no time. These tarts are sold at Simee Wet Market. Come early in the morning if you want to try the egg tarts. Pulau Pangkor is easily accessible by speedboat from the jetty of Lumut which takes about 30-40 minutes. This island has been developed to accommodate the many tourists that come here especially during the weekends. There are many hotels and resorts that have been established at the west coast of the island. Besides tourism, fishing and dried sea products are the main industry here. If you prefer to stay in Lumut, there are a range of budget to 3 Star accommodation that you can stay. Teluk Batik is a coastal beach which is about 35 minutes away from the town of Lumut. This beach is popular with the locals especially during the weekends and public holidays. The place was recently refurbished with many stalls and washroom facilities for your convenience. You can swim here and take your shower at the public washrooms which are usually open until 7- 8pm. Teluk Senangin beach is not a well established coastal beach and the facilities here are pale in comparison with Teluk Batik. However, if you are adventures and prefer a more quiet beach, Teluk Senangin is the place to go. You can swim and stay at some of the chalets here. The only 4 Star Swiss Garden and Spa hotel in this area is located within the vicinity. Teluk Rubiah beach is about 30 minutes drive away from Lumut. 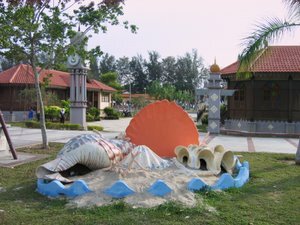 This beach is located at Teluk Rubiah Beach and Golf Resort and one can drive there for a time of relaxation. This place is good for team building events. Pasir Panjang beach in Segari is the longest beach in Manjung stretching about 8km. There isn't any washroom or changing facility at this beach This beach is still undevelop and used to be the nesting place for Green Turtles. In an effort to preserve this species, the Pasir Panjang Turtle Hachery Centre was setup in 1990 for this purpose. Perak Museum was built in 1883 and is the oldest museum in Malaysia. See the stuffed animals, old bicycle, old radio and history of Perak here. This museum is located in Taiping. Beruas Museum has exhibits that go all the way back to the 16th century. The Gangga Kingdom used to thrive here. Taiping Zoo is one of the best managed zoo in Malaysia. Sit on the tram and enjoy a 20-25 minutes of ride and see the many endanger animals here. Bukit Larut is the popular highland resort that attracts many visitors especially during the holidays. There isn't any hotel here except for government rest houses that you have to book in advance. A good place for bird watching and enjoying the nature. Taiping Lake Gardens is one of the oldestlake gardens in Malaysia. It was voted the Most Beautiful Public Garden in Malaysia by the Government in 1996. Tempurung cave is one of the biggest limestone cave in Peninsular Malaysia. If you are adventures, try the 4 hours exploration of the cave. Remember to come early in the morning for this feat. This cave is located in Gopeng. Tambun cave is located in Tambun and Kanthan cave in Chemor. Nea cave is famous with photographers who want to take natural caves formation photos. This cave is located in Kampung Kepayang. Kuala Woh Recreational Forest in Tapah is a good place to unwind, have picnic with your family or camp here with your friends. Leaning Tower of Teluk Intan was built in the year 1885. This 8-storey unique building is 25.5m tall and made of bricks and wood. Kellie's Castle is an uncompleted mansion built in the year 1915. This place is a popular location for photographers and is located in Batu Gajah. Sungai Klah Hot Springs has one of the best and well managed hot springs in Malaysia. Located in Sungkai, this place is an ideal location for family outings and a time to rejuvenate yourself. Silibin Waterfalls is located in Kledang Sayong Forest Reserve and is located near Ipoh. It is located deeper in the forest hence going in big group is advisable. 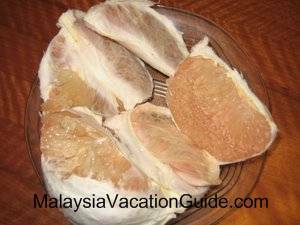 Tambun Pomelo is a signature fruit of Perak. This juicy and sweet fruit is available throughout the year with price ranging from RM5-RM18 per fruit. Sitiawan is famous for Kong Piah and Foo Chow Wantan Mee. Try also the cendol which is among the best in the country. Sitiawan Seafood such as sweet sour fish maw, red wine mee suah and sweet sour fillet fish are some of the popular Foo Chow food in this area. Villa Restaurant in Kampung Cina is another seafood restaurant that you can go to. Try the fresh coconut juice and flower crab here. Get the mee suah directly from the producer while you are here. Mee Suah production in progress. Teluk Intan is famous for "Chee Cheong Fun" and "Heong Peah". Drop by these shops and get some before you leave the town.